We are a professional brick paver contractor with 20 years of stone, rock, cement, concrete, and brick pavers experience. We install custom patios & driveways for Walla Walla, WA and Tri Cities, Washington. Here at Ace Landscaping our goal is to provide beauty, and craftsmanship, in every custom brick or stone paver job we do, plus offering you some of the best warranties on your completed paver job. We first put together a FREE design, working to capture your ideas, and backed up with our over 20 years of experience, so your layout will not only be extremely structural, but will be a very unique and innovative design. Next our crew of experienced landscape professionals will install your brick or stone, paver patio, walkway, or driveway, in a prompt, yet very detailed manner, that will exceed you expectations. We also use only the highest quality commercial products on the market today. Our business is doing high end custom work, their will be no corners cut. I have been doing paver jobs for well over 20 years. I have taken my job more than just a few steps above & beyond what the DIY shows, or the books will tell you. So if you want a quality brick or stone paver job that I will personally stand behind & warranty, please call me today for your FREE estimate. (509) 522-2081. Thank You! The Ace Landscaping crew were very proficient. They came with suggestions and listened to what we wanted. Before they began the project they made sure we knew exactly how they were going to get the job done. 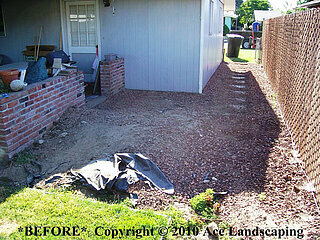 We would recommend Ace Landscaping to any one wanting high quality work and a job well done. I am happy to comment on the services that have been provided to us by Ace Landscaping. 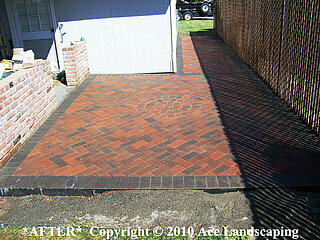 We first met the owner in 2005 when we decided to enlarge our brick paver patio. We found him to be very knowledgeable & helpful in what we wanted done. He and his crew members are prompt, hard working and clean up after themselves. Over the years, they have installed a sprinkler system, planted flower gardens and laid sod all according to the design we requested. They answer any questions that come up. I recommend them highly and know that any work needed done would be done well.